Each $149 box contains 10 decks. Each deck contains 61 cards. 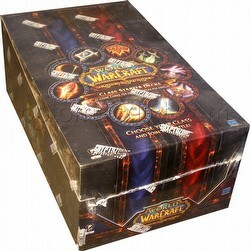 Each Class Deck box includes 10 decks. Each deck includes 60 cards (including 3 rares), 1 Unique Hero card, a rulebook, a Loot or Crafting card, and 1 booster pack. Each box includes 5 Horde decks (Blood Elf Death Knight, Undead Mage, Troll Warrior, Tauren Paladin, or Tauren Druid) and 5 Alliance decks (Worgen Warlock, Human Priest, Dwarf Hunter, Draenei Shaman, or Night Elf Rogue). Decks will be labeled with the hero race. There are 3 possible loot cards - Landro's Lichling (common), War Party Hitching Post (uncommon), and Savage Raptor (rare).